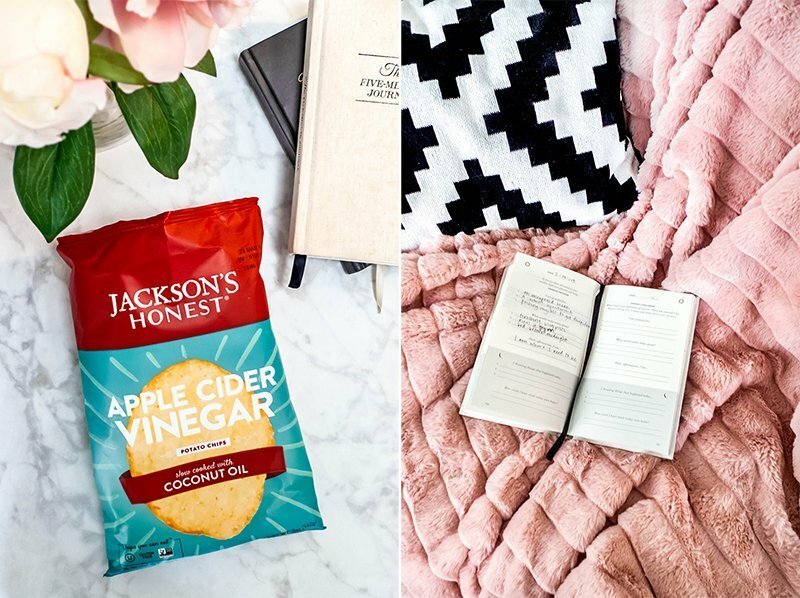 This is a sponsored post written by me on behalf of Jackson’s Honest. All opinions are 100% mine. Do you ever keep working until the moment you go to bed? Or do you feel so drained after the workday that you binge on junk food and scroll through Instagram for hours? I think this the go-to route for many of us when dealing with stress. The trouble is that getting into certain habits like this can affect your health and mindset. You might think you’re relaxing when in reality you’re avoiding the things you know are good for your health and well-being. 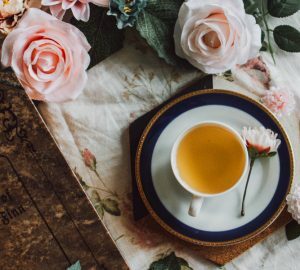 If you want to ensure that you’re relaxing and taking proper time for self-care, you have to consider what you’re doing before you go to bed. 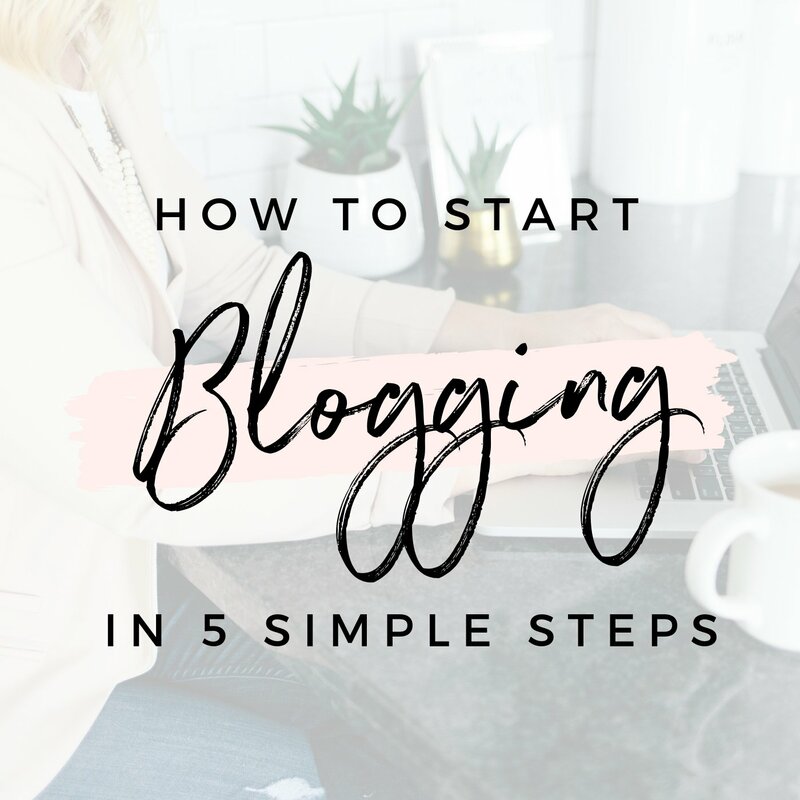 That’s why it’s so important to plan out an evening routine that helps you wind down and gives you something to look forward to. An evening routine helps you set a clear boundary between work and rest which we all need in our lives. With the right evening routine, you can start the next day feeling prepared and refreshed instead of overwhelmed and sluggish. 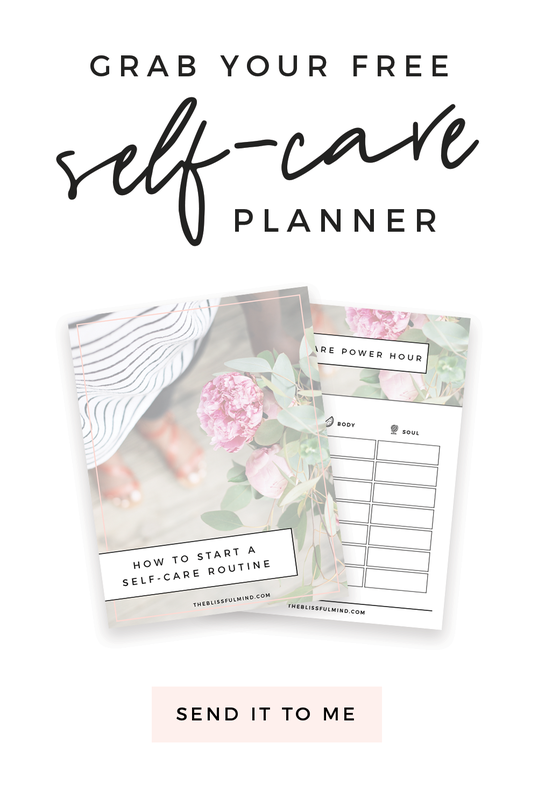 In this post, I’m sharing how my evening routine plays an important role in my own self-care and relaxation. 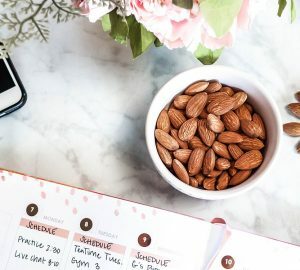 I hope my routine gives you some inspiration to create your own evening ritual and make healthy choices at the end of the day! I usually get done with work around 8:30, so I’ll finish up and try to get as far from my computer as possible. I like to put my phone in another room at this time so I’m not tempted to check emails or scroll through social media. I know it’s not exactly healthy to binge watch Netflix for an entire evening, but I do find it relaxing to watch an episode or two of a show that I’m enjoying. I recently watched a Korean drama called Memories of the Alhambra on Netflix, and I absolutely LOVED it. Highly recommend. Sometimes shows can feel like an escape, and I think it’s important to have something that takes your mind off work. For as long as I can remember, I’ve always been an evening snack person. I think my family has always been the type to eat a snack in the evening while watching a show, and that’s clearly rubbed off on me. Lately I’ve been trying to make healthy choices since I don’t want anything too heavy sitting in my stomach before bed. 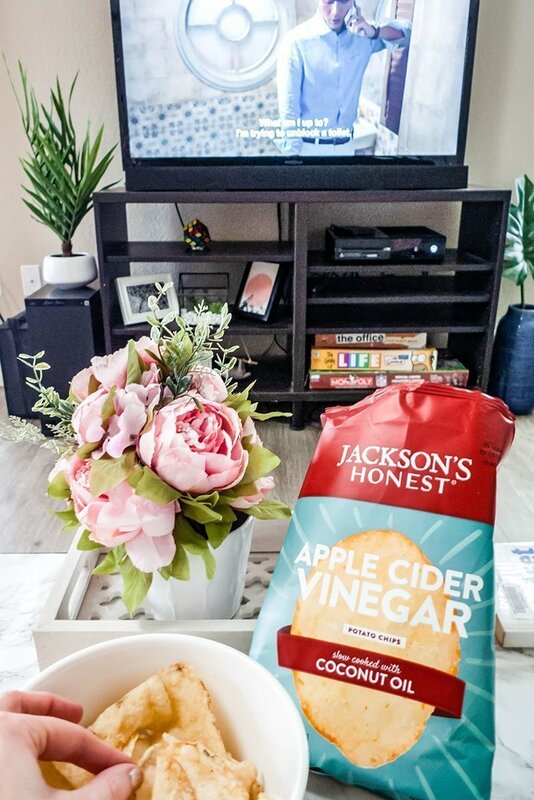 One of my recent favorite finds is Jackson’s Honest Potato Chips. 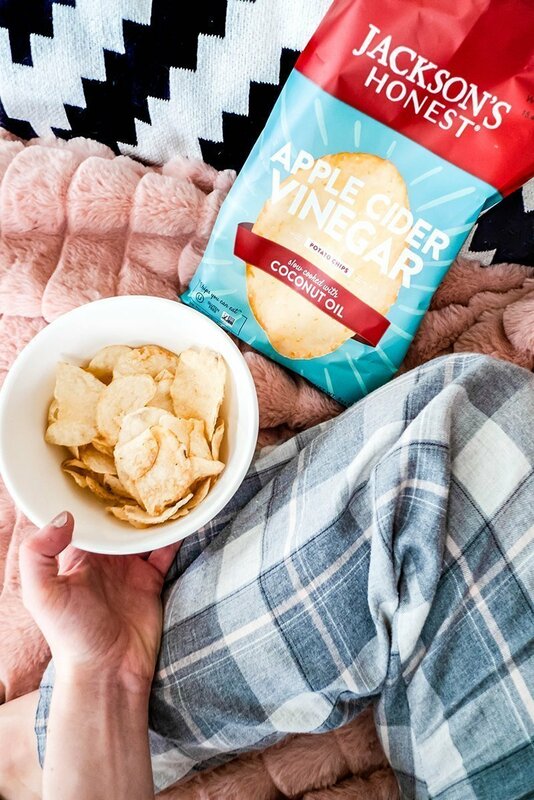 They’re grain-free and gluten-free, and they have a huge variety of flavors like Sweet Potato, Apple Cider Vinegar (tastes like salt and vinegar but better! ), and Tangy Barbeque. These chips are cooked in coconut oil over low heat which means they are full of healthy fats. I found these at a local health food market in my area, but they’re also available at places like Whole Foods. 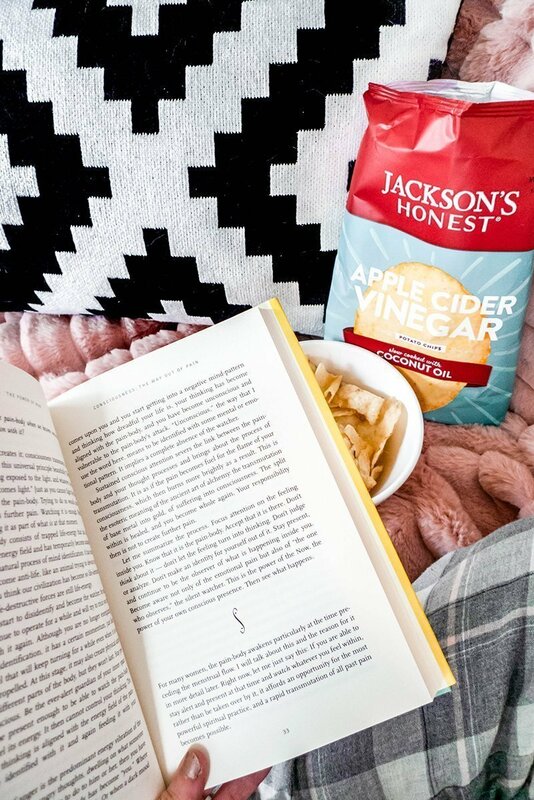 The Jackson’s Honest brand is all about the message, “Goodness. Pass It On.” Jackson’s Honest was was founded by a mother in her kitchen as a way to bring her son’s struggle with an extremely rare autoimmune disease to a wider audience. I think we can all use the “Goodness. Pass It On” message to share our stories, discoveries, and hope with those who might need it most. After I’ve had my snack and relaxed on the couch (around 10pm), I’ll clean up the kitchen and living room before heading to bed. I do this so that when I get up the next morning, I’m not faced with mess and clutter. I’ll take a look at my calendar and to-do list for the next day and organize my list based on what needs to get done first. I’ll also put timestamps next to each to-do list item so I know exactly when to work on them. I’ll change into pajamas and go through my skincare routine. I always take my makeup off before bed, and my typical skincare routine includes double cleansing with a balm and cleanser, toner, serum, eye cream, and night face cream. I consider skincare to be a relaxing ritual, so I make sure to do this every night. I pretty much have to red before I go to bed or I feel like my mind doesn’t get time to properly settle down. I stick to reading fiction books at night (rather than non-fiction) because I find that non-fiction books only make my brain go into overdrive. Think about what would make you feel relaxed at the end of the day. What activities help you unwind? Also consider what kind of environment helps you feel relaxed. Do you need to make your living room or bedroom more peaceful for your evening routine? Try to make the space around you as relaxing as possible. Think about what you can do the night before to make tomorrow less stressful. Maybe that’s planning your day, making your lunch ahead of time, or choosing an outfit for work. There’s only so much time in the evening after work, so don’t try to cram in too much. 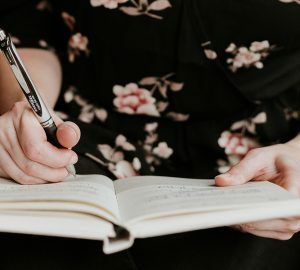 If you try to do everything with your evening routine, you’ll only feel stressed out if you don’t get to it all – and that’s the opposite of what we want. Instead, think about what three things you could do in the evening to help you relax and unwind. 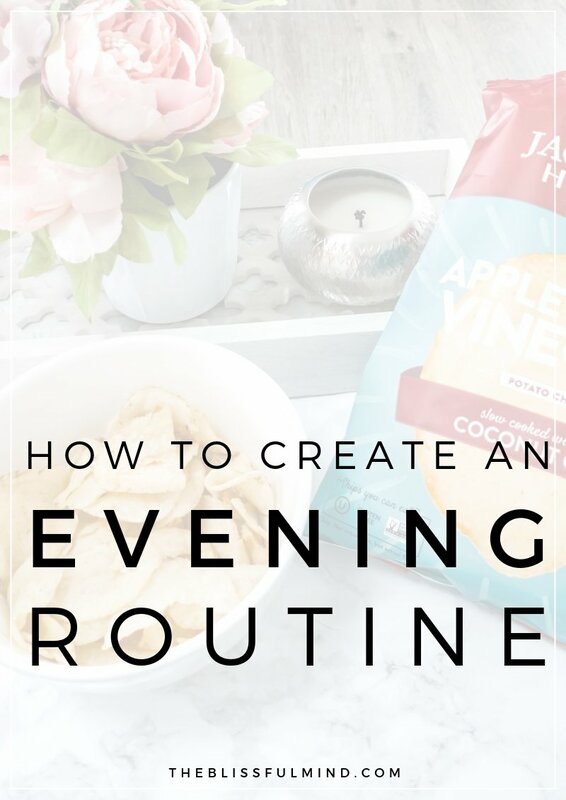 I hope this post has encouraged you to switch up your current evening habits and focus on cultivating a healthy evening routine. 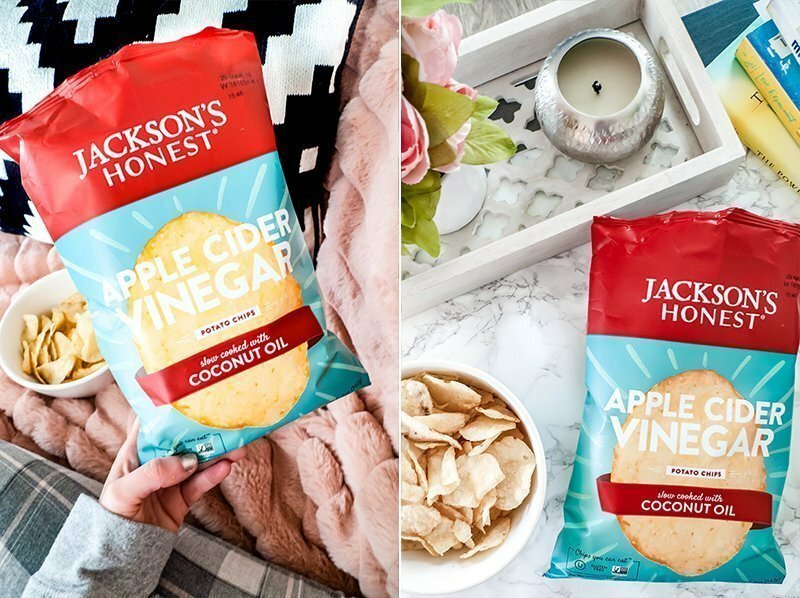 Let me know what your favorite healthy snacks are and what flavor of Jackson’s Honest Potato Chips you want to try! I’m so guilty of not really stopping work to relax. I most definitely need such a relaxing evening routine! Loved your ideas! Are Jackson’s honest also available in Europe? Morning routines are great and everything, but I am so here for evening routines. 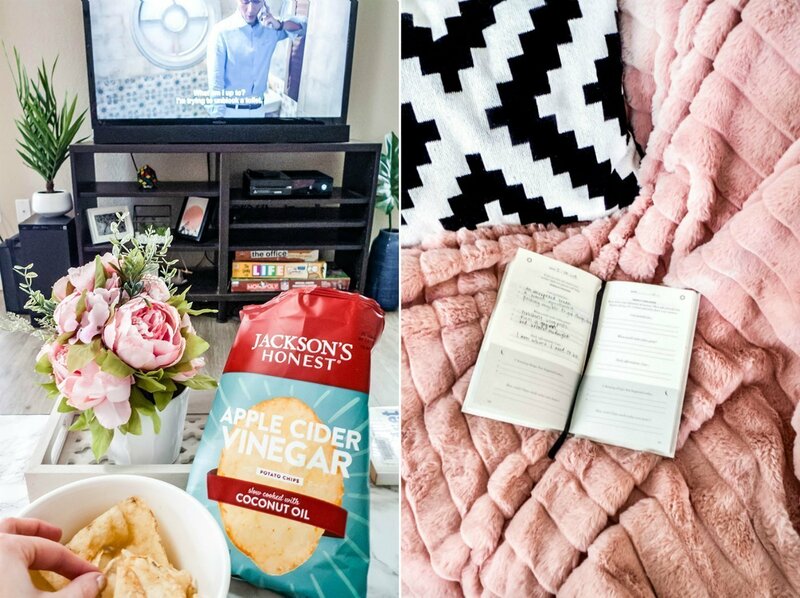 Getting cozy and staying in is the best. I really need to get better about being screen-free before bed, that’s a real struggle! 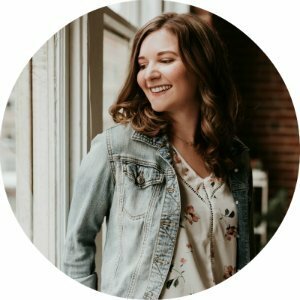 Love your ideas for evening routine!